Summit Daily News/Ben TrollingerCory Forster, Dillon Dam Brewery. Cory Forster is a farmer at heart. A transplant from central Minnesota, Forster is now well-known in Summit County for his work as the head brewmaster at the Dillon Dam Brewery. Although now he deals with hops and malt rather than corn, he feels strong similarities between the farm jobs he did as a teenager and the brewing job he does now. The hard work isn’t the only related thing between the two. Forster said that some of the equipment and chemicals he uses are exactly the same as those used on dairy farms. But don’t worry; milk production isn’t in the Dam’s future. Forster is incredibly dedicated to the brewing of beer. Forster’s an easy guy to spot in a crowd – tall, broad-shouldered, with wild, curly red hair. His love of beer is apparent, as he smoothly maneuvers the conversation between the history of European beer to the take-off of modern microbrews, the availability and value of various types of hops and the beers he’s currently working on. Forster first came to Summit County in 1994 and did what newcomers do – he got a job at a resort. For the next several years, he worked multiple jobs, some of which he wasn’t too fond of, in order to live in the mountains and enjoy all the outdoor recreational activities. “Every day on the way to work, I would look up at the mountains and just breathe in the mountain air and I would just be like, ‘All right, I hate my job but I love where I live; I’m gonna tough it out,'” he said. And tough it out he did. 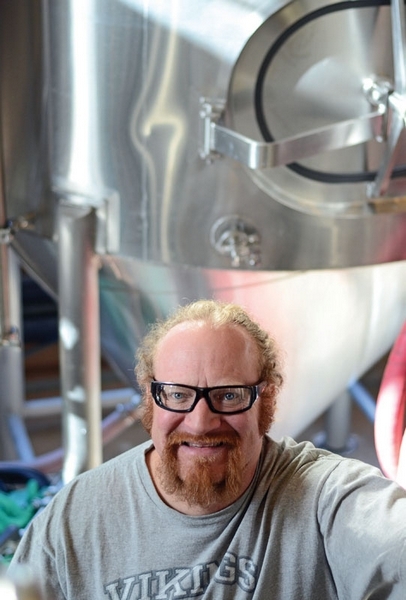 He can tell you the exact day he started work at the Dillon Dam Brewery – Jan. 1, 1998. He started as a waiter and, as time went on, found himself in nearly every position with the restaurant, including bartender, bar manager, booking bands, creating posters, etc. He also made sure to attend every beer event and festival he could, which did not go unnoticed. When the assistant brewmaster got engaged and moved out of the county, Forster was handpicked to take his place. “They knew me, they knew my farmboy work ethic, so they chose me from behind the bar and trained me on premise. … I learned pretty much everything here,” he said. Now, Forster is in charge of the entire brewery, which produces roughly 2,000 barrels of beer every year. He does this with just one other full-time employee and a few part-timers. It’s hot and heavy work, with lots of lifting and moving equipment and kegs, plus monitoring every single step of the process and troubleshooting whatever problems come up. But there are plenty of perks, too. One of the big ones is the sense of camaraderie among other brewers, particularly those nearby in Summit County. “We’re really all on the same mission to just make better beers,” he said. Now, Forster is gearing up for summer. What will no doubt be a popular choice is the Heffeweizen, with cloves, banana and a hint of citrus. Partially filtered, it’s a thick, blonde beer and comes with a slice of orange or lemon on the rim. “Forget orange juice; it’s the new ‘sunshine in a glass,'” he said with a laugh. Plans in mid- to late summer include a possible Belgian witbier. The well-received Dam Gogh beer, which was brewed in conjunction with the Denver Art Museum’s Van Gogh exhibit this fall, will also make a comeback, thanks to popular demand.